Opened in 1999, the Compass (Computer Assisted Instruction) Lab provides an interactive and versatile educational environment. As a computer lab built around laptops, our classroom spaces can serve many purposes. With wall-mounted as well as portable dry erase boards and flat screen televisions, floor space is freed up for any number of configurations made possible by our modular furniture. Students and instructors are provided access to media production tools such as Audacity, Garage Band, iMovie, Keynote, and several word processing and data management products. Such media production tools provide invaluable experience in new and varied forms of production. Additionally, the lab has audio and video equipment for producing new media compositions. The lab can be used to enhance traditional modes of writing pedagogy by creating an environment where new methods of composing abound. In addition to our laptop carts and classroom spaces (in Des Peres Hall 206, 208 and 212), DPH 216 has been renovated and re-envisioned as a studio space for students in both first-year writing and Rhetoric, Writing and Technology (RWT) courses. The media studio is designed to provide a comfortable and collaborative space for students to plan, produce and workshop a range of media projects from short videos to longer, audio narratives. Features include a media bar that provides for displaying and workshopping projects on one of three 36-inch flat screen televisions. The increased screen real estate promotes a more collaborative and precise work experience. The bar set-up likewise allows for several small groups to work in this way. The media studio also features two networked iMac computers dedicated to long term, digital humanities projects. Finally, the studio includes a recording booth soundproofed and set-up for students to record audio tracks: for instance, podcasts and narration for videos. The recording booth is furnished to accommodate multiple students, allowing for interviews and group recording sessions. 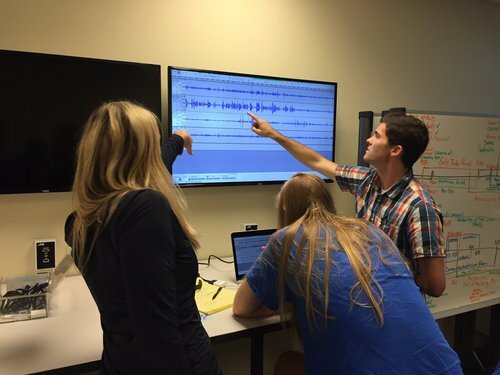 In addition to the renovated studio space, the lab has invested in professional quality audio recording equipment to used by students enrolled in Rhetoric, Writing and Technology courses. Our portable audio kits make it possible for students to do field recording and conduct interviews beyond the confines of the classroom.